The EcoHitch® invisi hitch for the 2013-2017 Subaru XV Crosstrek is designed to be completely hidden behind the knockout plate so you don't have to see an unsightly crosstube underneath your vehicle. Rated for 525 pounds tongue weight and 3,500 pounds towing weight, this Invisi hitch for the XV Crosstrek is full of personality that complements your Subaru. *If you’re going to be towing and need trailer wiring, click here for the 2013-2015 wiring! Ensure your wiring harness does not drag on the ground by visiting our Eclipse trailer wiring bracket page. With this hitch for Subaru XV Crosstrek, you’ll be able to bring your bikes, a cargo rack for your belongings and more. With this hitch for the Crosstrek, we have manufactured a perfect hitch to accompany your fuel-efficient Subaru since it is designed to be lightweight and is made of recycled materials, making it an eco-friendly hitch. 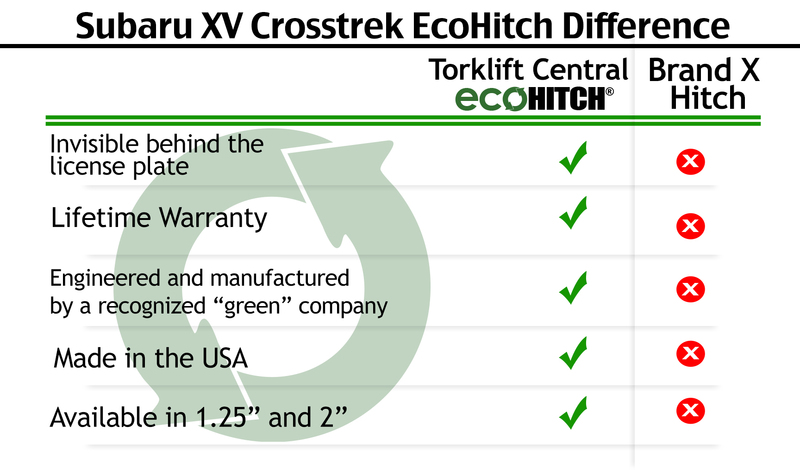 Engineered to meet and exceed stringent national SAE J684 safety standards, the XV Crosstrek EcoHitch is rated at 525 pounds tongue weight and 3,500 pounds towing weight capacity you’ll be able to utilize all of your cargo space and still bring more on the next journey with your XV Crosstrek trailer hitch. Our EcoHitch® invisi hitch gives you the ability to have an amazing ride in your Crosstrek without conceding style because only the hitch receiver is visible once installed behind the knockout plate and in use. No one will know that you have a hitch installed unless you are in the process of using it for your adventure. The Invisi EcoHitch is completely hidden behind the license plate or factory knockout panel so you do not see the hitch when not in use. The Invisi hitch has the highest level of ground clearance out of all the EcoHitch models available. x7203 32.1 lbs 39.75" x 12" x 17.5"
x7204 30.2 lbs 39.75" x 12" x 17.5"
*WARNING* Your vehicle may have a lower tow rating than this trailer hitch. If your vehicle's tow rating is less than the rated towing capacity on your Torklift Central trailer hitch, your trailer hitch capacity is limited to your vehicle's factory rated towing capacity. Due to the invisi style of this hitch. All ballmounts/bike rack stingers cannot exceed more than 2-3/8” of an inch from the center of the pinhole to the end of the stinger. Failure to do so will cause ballmount/bike rack stingers to not fit or cause NON WARRANTIED damage to the exhaust system. To make your ballmount or bike rack fit, you can shorten the stinger to allow it to fit properly with the invisi hitch.